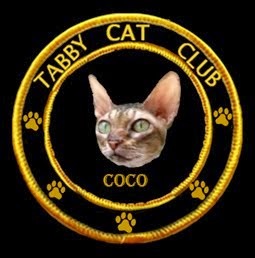 Coco, who's formal name is Furrydance Colours Cove, is a Cornish Rex cat. She was born on September 29, 2005. Her beautiful coat color is called Brown Patched Tabby, and it accentuates her exotic look! For a girly-girl, she has a streak of tomboy in her, as she has three brothers. None of them desired to strut the Cat Walk, but they all are very handsome! 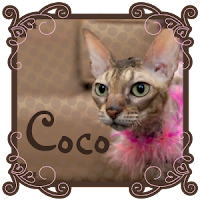 Early in life, Coco was groomed to become a show cat, but that wasn't her cup of tea. 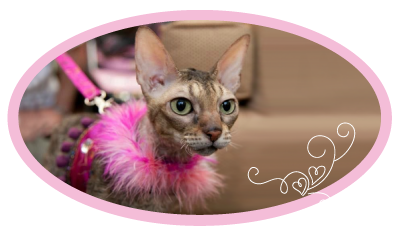 Now she travels across the country, attending fundraising pet fashion shows, pet blogger and social media conferences, and cat shows as a 'Pet Me' cat, in her Pink Catillac! 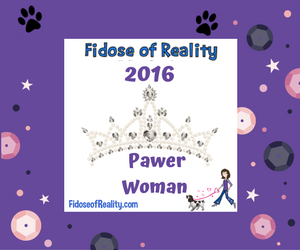 It seems she has found her niche in being an ambassador for kitties in need, raising awareness in her own unique fashionable way!